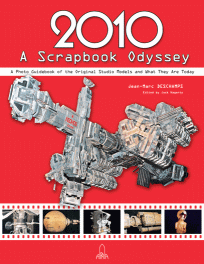 2010 A Scrapbook Odyssey: A detailed examination of filming models from the movie 2010: Odyssey 2 (aka 2010: The Year We Make Contact in the US). Author Jean-Marc Deschamps (who wrote the special edition of Dixième Planète on the movie 2001: A Space Odyssey) was given access to the models as they were being restored for auction. He took hundreds of photos of them which, when combined with period photos of the movies production, form a complete record of the models from this film. As a bonus, Jean-Marc secured an interview with lead model maker on the film, Mark Stetson. He also presents a somewhat disturbing glimpse at what remains of the first version of the "Starchild" mannequin (not the one used in filming). 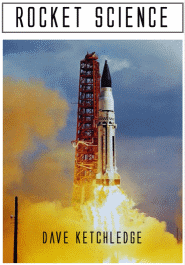 Rocket Science: Lots of books claim to be "rocket science" but this is the real deal. This massive work is the outgrowth of two of David Ketchledge's earlier works, an article on "Vertical Trajectory Systems" in the Tripoli journal, High Power Rocketry, and David's earlier book, The Next Shuttle. In its 920 pages, Dave covers vehicle basics (nozzle thermodynamics, aerodynamics, structural strength), performance basics (flight mechanics, orbital mechanics, aerothermodynamics) and applications with an eye to the hobby (HP rocket design, guidance systems, payloads and telemetry, radio control). He then devotes two chapters to current "cutting edge" vehicle development programs, and the latest research into Reusable Launch Vehicles (RLV). And if that's not enough, there are over 1,000 pages of source reference documents included! To try your hand at piloting, a full featured flight simulator is included that will let you fly a variety of air and spacecraft on the Earth and around the Solar System. This work is destined to become the standard reference for professionals and hobbyists alike. 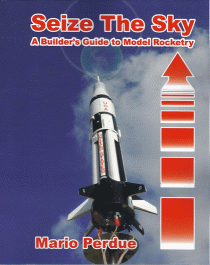 Seize The Sky: A project-oriented guide to the rocket hobby, this book is primarily for people who are interested in model rockets in the low to mid power range (A to G motors). There are tips for hobbyists of every skill level so that it will continue to prove useful as the reader gains experience in the hobby. An overview of the hobby basics is followed by answers to some frequently asked questions and basic building techniques. The meat of the book, though, is in the build projects, which are grouped by several themes.